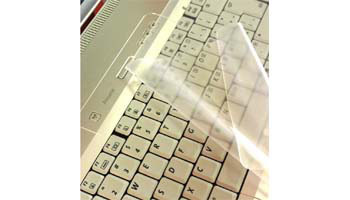 The universal laptop keyboard protector covers most laptop keyboards to seal out dirt, spills, moisture, sand, and other contaminants. The result is protection that allows you to use your keyboard in many different kinds of environments without worry about contamination. Does not require any adhesive to install. Quickly and easily removable. Not compatible with laptop keyboards that have numeric keypads.